B.F. Goodrich began construction on the Miami Plant in 1944, opening to production in 1945. It operated 24 hours a day, 7 days a week for 40 years. 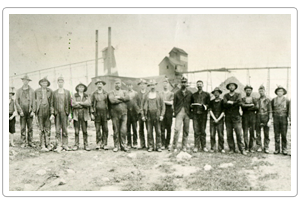 At its peak, the Miami B.F. Goodrich plant employed nearly 2000 workers who commuted from all over northeast Oklahoma, southeast Kansas and southwest Missouri. In addition to a full line of car tires, the Miami plant produced all sizes of truck and tractor tires and also the largest tires ever made by Goodrich. These huge tires were off-the-road tires produced for the LeTourneau earth moving equipment. These tires measured 11 feet tall and weighted in at 7,000 pounds. The host of former Goodrich employees who shared information, artifacts and photos for this exhibit, as well as those who gifted many of these items to the museum's permanent collection.